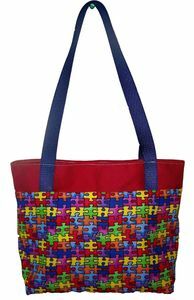 This autism tote has red fabric on top and autism puzzle fabric all along the bottom. It is durable and machine washable. The pockets inside make it easy to carry small things in it without them getting lost. These bags are all hand made here in the USA. Makes a great gift for teacher, therapist, parent or friend. 2 inside and 2 outside pockets. Lined with magnetic snap for closure.